There have been two main changes in dietary habits from the 1970s (before the obesity epidemic) until today. First, there was the change is what we were recommended to eat. Prior to 1970, there was no official government sanctioned dietary advice. You ate what your mother told you to eat. With the publication of the Dietary Guidelines for Americans, we were told to cut the fat in our diets way down and replace that with carbohydrates, which might have been OK if it was all broccoli and kale, but might not be OK if it was all white bread and sugar. But the other major change was in when we eat. 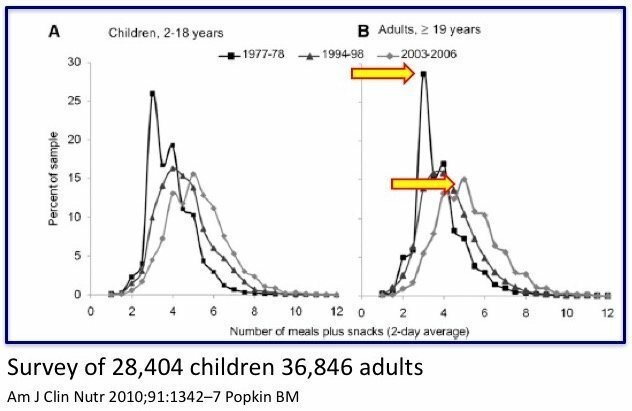 There were no official recommendations on this, but nevertheless, eating patterns changed significantly, and I believe contributed equally to the obesity crisis. From the NHANES study in 1977, most people ate was 3 times per day – breakfast, lunch and dinner. I grew up in the 1970s. There were no snacks. If you wanted an after school snack, your mom said “No, you’ll ruin your dinner”. If you wanted an bedtime snack, she just said “no”. Snacking was not considered either necessary or healthy. It was a treat, to be taken only very occasionally. By 2004, the world had changed. Most people were now eating almost 6 times per day. It is almost considered child abuse to deprive your child of a mid-morning snack or after school snack. If they play soccer, it somehow became necessary to give them juice and cookies between the halves. We run around chasing our kids to eat cookies and drink juice, and then wonder why we have a childhood obesity crisis. Good job, everybody, good job. Without any science to back it up, many nutritional authorities endorsed eating multiple times per day as a healthy practice. There were no studies that remotely suggested this was true. It was likely the successful efforts of snack food company advertising to dieticians, and doctors, clueless about nutrition at the best of times, who simply went along for the ride. When those overweight individuals eating more than 14 hours per day were simply instructed to curtail their eating times to only 10-11 hours, they lost weight (average 7.2 pounds) and felt better even though they were not instructed to overtly change what they ate, only when they ate. This has huge metabolic consequences. 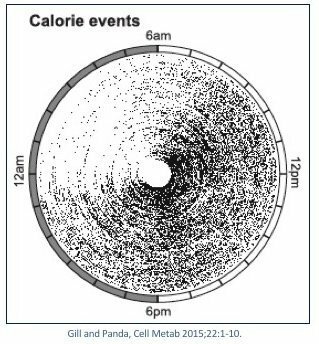 A fascinating study was recently published directly comparing a regular eating schedule to an optimized time restricted feeding schedule. Both intermittent fasting and time restricted eating tend to produce some reduction in food intake, and therefore it is never clear whether the benefits of these strategies are due to timing (when to eat) or food intake (what to eat). The benefits were huge. Mean insulin levels dropped significantly, and insulin resistance dropped as well. 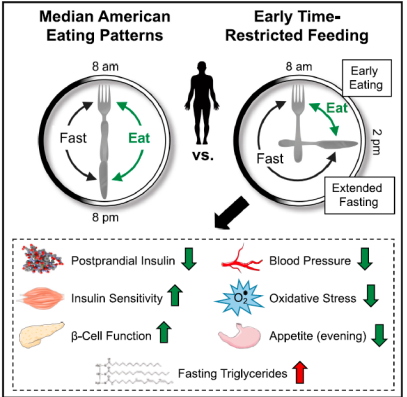 Insulin is a driver of obesity, so merely changing the meal timing and restricting the number of hours you ate, and also by moving to an earlier eating schedule produced huge benefits even in the same person eating the same meals. That’s astounding. 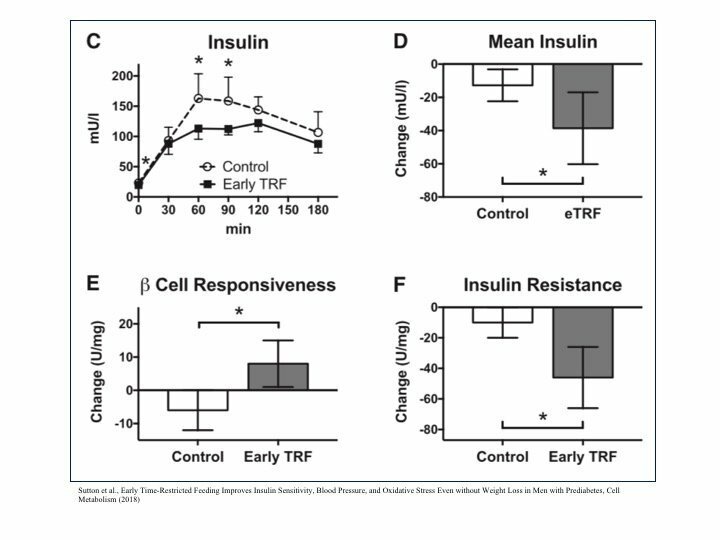 Even more remarkable was that even after the washout period of 7 weeks, the eTRF group maintained lower insulin levels at baseline. The benefits were maintained even after stopping the time restriction. Blood pressure dropped significantly as well, demonstrating even more metabolic benefits. Same person. Same number of meals. Same food. Far improved metabolic profile. Good info to consider….Thanks for continuing to educate me. This should be obvious, so why do I keep doing it? Time restricted eating only works if you don’t binge on junk food after lunch. For me it’s ice cream, cake, milk chocolate and cookies. You are correct it is quite difficult to eat at/by2 pm and be done for the day. I will strive for 6 pm because that is hard too! I don’t eat breakfast so that’s twice a day eating, basically. I still think processed carbs (for me at least) are the devil. 47 yrs of obesity and when i gave them up the weight finally starts to come off. There has to be something to it. I am an experienced IF-er, keeping a daily eating window of 4-5 hrs for a keto-friendly meal + one snack. But I have “saved” that meal for 8 pm or later, for fear of having nothing left to look forward to, post-dinner. This article is the first thing that has ever convinced me to change that. Wow! It seems really important. So now I will attempt to maximize my health benefits by moving dinner back to an early hour as often as my work schedule allows. It’s been a month, did you commit? Makes sense and fits with how Im feeling more comfortable and full in the evenings these days. I have a question on alchohol though. Will a glass of wine in the evening (when we’re not hungry) contribute to an insulin spike ? As is frequently the case in biology there are other considerations. Several areas in The Diabetes Code describe potential liver issues – NAFLD – if the situation is compounded by the existence of metabolic syndrome. I am one of those who felt hunger in the evening my entire life. This changed drastically since I implemented blue light control – blue blockers after sunset time and when watching TV, software warming the computer screen light, and some more practical steps. This helped immensely; my eating window is now pretty much ending at 1-2 pm, except for occasional social event. Some days I just have largish breakfast and fast till next morning, easy and naturally. If you have troubles controlling hunger in the second time of the day, try this corrective action for your circadian rhythms. Thanks again Jason, I have been low carb for 3 years and still struggle with prediabetes. I am now recuperating from a tummy virus and havent eaten in a few days, so now is the time for me to start this. The timing of this article has been great for me!!!!!!!!!!!!!!!! I might have to try this, for weekends at least, as it’s impossible with my work. I found eating only between 12pm and 7pm helpful. I see the fasting triglyceride level increased and wonder if the reason for this is known. I find it impossible to keep a schedule like this. I’m often not home until after 6pm, and if I want to see my kids at all, that’s when I see them. We eat dinner together, or try to do so. Even during the weekend, our days are busy enough that it’s difficult to eat until dinner. Yes we just need to steer away from the outdated guidelines and use what we can from this great advice and the other advice available like you say LCHF or some form of fasting. So much easier than the old slog of calorie restriction with low fat. Accompanying the link to the study, although following the link to the summary of the study made no mention of this. I guess I need to track down the full report. I am not being critical of restricted time feeding as I know it works for weight loss, as does intermittent fasting (like a 5 / 2 diet). The link to a free dowload is identified above in the reply to juliet. It seems the researcher missed the dawn phenomenon – “… a normal occurance..” – described by Dr Fung on page 203-204 in Diabetes Code. Thank you so much for posting this! It was exactly what I needed to read and to share with an interested co-worker. Thank you also for all you do! A “Fungster Shirt”! Simstar, Dr Jason will feel like a rockstar. Am I wrong in understanding that this eTRF study set out to test and indeed showed that reduced insulin is not necessarily linked to weight loss ? I understood that the idm approach is based on the causality of reducing insulin and weight loss. This seems to show that the two are not necessarily causally linked. If I fast and restrict eating hours my insulin markers will improve but I will not necessarily lose fat/weight? I would very much appreciate clarification please Dr Fung. Thank you. To the first question it may be that the 2pm dinner tends to synchronize that meal’s insulin hit to coincide with the circadian rhythm for a synergistic effect. To the second question given an identical caloric intake, the same coordination might enhance weight loss whereas off-sync it might not. Would love to read the full study. But you have to buy the study to get the complete text. Yes you are right. I just read the abstract which was enough for me….unless the full text answers my conundrum perhaps. The “causality between reduced insulin and losing fat” was proven beyond doubt in 1921 with the cure for Type 1 diabetes. The fact that this study had to increase calorie intake on the eRTF arm – the arm that demonstrated those reductions in insulin levels – was only necessary because they were losing weight. Thank you. I can’t see your comment here but that restores my faith in the insulin : fat causality…Thank you. Yes much better! I need to read the whole study. Thank you for the link. This is the main issue between conventional thinking/medicine and alternative healing. You mentioned this on pages 205 – 206 of “The Complete Guide to Fasting”. This expands that nicely. Thanks for all you do to help people become more healthy. Warm regards. The study seems to compare a 12-hour fast with an 18-hour one. Of course 18 hours is better. I would be more convinced if it compared two 18-hour protocols – breakfast&lunch vs lunch&dinner. Also, the definition of “night” is a bit vague. If it means “after dark”, I’m safe because I eat dinner around 6pm – at least an hour before it gets dark. I have a question that’s been puzzling me for a while; if anyone can answer it, I’ll be severely grateful. Why is that, whenever I read about extended fasting, people say ketones aren’t released until 48-72 hours, yet with intermittent fasting apparently it only takes 10-12 hours for glycogen in the liver to be depleted? Your liver glycogen can only be the primary source of fuel for 10-12hrs. Not 48-72hrs. Perhaps that 48-72hr figure comes from how long it takes for your body to get into ketosis from a ketogenic diet. The keto diet allows you to consume a little bit of carbs (which would “put more in the tank” of your liver glycogen stores) which would be why it would take longer than intermittent fasting (where no carbs are consumed). Since last September I have restricted eating to a 7 hour window, from 5 a.m. to noon. I’ve lost over 70 pounds and am never hungry. I will eat this way for the rest of my life. Also a vegan. KM 60 and all of you “Fungsters”, I too have seen a great improvement in my weight and health by IF. I have no hunger at all, doing a 10AM LCHF snack and lunch @ noonish. Then I drink ice water all day and night, feeling fantastic. I am getting ready to go OMAD this week. I have a stubborn 6 lbs to lose, and it’s coming off, and my insulin resistance is under control. I grazed 10Xs a day, always feeding, never fasting. My poor pancreas. Idiot! Fasting is the best way of weightloss.l did this and i lost 5 kgs in ten days. Due to some problems i stop my fasting but now i feel that i have to start my intermittent fasting . 18:6 .window for 3 days a week. Doing intermittent fasting is actually easy and I find a sleep better at night. Breakfast and lunch and then stop. I try to stop eating around 2:00pm everyday and I’m not hungry at night. Hi! I started 16/8 IF recently , been a week. I eat 12-8pm. But I feel too exhausted during the day. I am wondering why is that? I am 38 and no diabetes doing this for burning fat. Late to this discussion but I would love to see a study comparing two sets of groups that each eat only 5 hours a day – a 7 am to 12 pm group and a 2 pm to 7 pm group. I wondering how significant the difference would be in eating early versus eating late if the eating window is the same.